After completion of my Bachelor’s in Theoretical Physics (Particle Physics) in Spain, I moved to Heidelberg to do a PhD in Theoretical Astrophysics, more precisely on dense stellar systems and the cosmic growth of supermassive black holes. Later, I moved to the the Max Planck Institute of Gravitational Physics in Potsdam (also called the “Albert Einstein Institute'”, AEI) to work with the director, Prof. Dr. Bernard Schutz and Dr. Curt Cutler on General Relativity, in particular on Gravitational Wave Astronomy. During my time in Barcelona, with Ignasi Ribas and Jordi Miralda-Escudé, I worked on the formation and evolution of protoplanetary disks, which later led to the development of a hybrid algorithm to study the formation and evolution of protoplanetary disks. I then received an offer from the AEI in Potsdam to be a Senior Scientist in 2008 and after successfully raising a significant amount of third-party funding (i.e. not from the Max Planck Society), I created my own Gravitational Wave Astronomy group at the AEI to host my 4 postdocs and 3 PhD students. I obtained my habilitation at the University of Potsdam in 2016, and a docent title at the Technical University of Berlin, which means that I am entitled to teach there and officially supervise PhD astronomy students at the Zentrum für Astronomie und Astrophysik. In 2016 I got an offer to join the Institute of Space Studies located at the Campus of Universitat Autònoma de Barcelona thanks to a Ramón y Cajal fellowship. Their Gravitational Wave Astronomy Research and Technology group there has led the Spanish effort in the LISA Pathfinder mission and in the future LISA one. I also visit regularly the Kavli Institute for Astronomy and Astrophysics and the Academy of Mathematics and System Science in Beijing, where I lead a group in Gravitational Wave Astronomy. My main research focus has been Gravitational Wave Astronomy since 2004. The timing is excellent. GW Astronomy has become very appealing since the announcement of the first direct detection of a Gravitational Wave by Advanced LIGO in February 2016. For me this discovery was important not “just” because we have got now a proof for the existence of GWs, but because I had predicted the properties of the first Gravitational Wave ever detected: I anticipated that aLIGO would preferentially see binaries of black holes with the following properties: (i) masses between and , (ii) low spin magnitudes, of around and (iii) circular. This corresponds to the values of GW150914, the source observed. 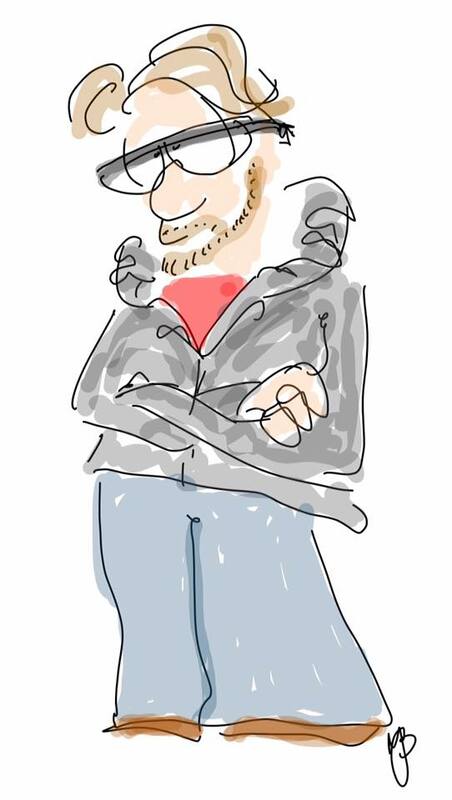 The awesome drawing of me has been done by my good friend Matt Benacquista.